Affordable Housing: CREDAI has a proposal with the government to establish Special Residential Zones as a solution to India’s affordable housing crisis. The proposal aims, among other things, at eliminating the roughly twenty-five percent estimated tax component on the unit price of properties and leveraging economies of scale while mandating smaller units (500 sq ft average) to keep costs low so that it becomes affordable en masse. Environmental Impact Assessment: An amendment to the notification to enforce compliance (2006) was proposed by the Ministry in 2009. The most important issue is requiring environmental clearance from the concerned authority (central government or state government depending on project) whenever a change in the process or product mix occurs. Regulation: CREDAI is involved in affecting policy in the Real Estate Regulation Bill. Their lobbying amounts to making certain that policy makers avoid an additional layer of bureaucracy when setting up this new regulatory body. CREDAI’s suggestion is to have a functional seamless unit (single window for all required clearances) in place with representation from CREDAI. 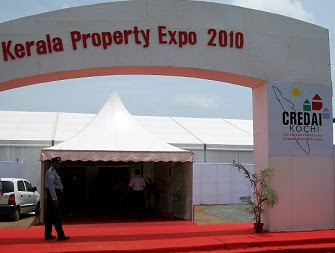 Others: CREDAI is also actively involved in policy issues such as Stamp Duty Rationalization, Urban Land Ceilings, Introducing Real Estate Investment Trusts (REIT) for better financial management of property developers, and promoting foreign ownership. Ready to Occupy Rs 9500 per sq ft – all inclusive Rs 85L (~$185,000) for 900 sq ft minimum Assured 8% return for first 9 years. 60-40 split on any difference based on the lease amount realized. Ground + 3 – retail shops, 4+ - office space. Retail already leased out to premium vendors such as Big Bazaar. 2011 December Rs 6250 per sq ft + special charges + statutory charges Rs 34L (~$75,000) for 450 sq ft minimum Office Space from 450 sq ft to 2375 sq ft across from Vallarpadam International Container Terminal (Rs 1800 crore project) available in 3 towers. 450 sq ft slots is sold out per their website. Ready to Occupy NA Rs 28L (~$60,000) all-inclusive for 490 sq ft apartment Prime Location next to Inforpark. Marketed as an Invest -Lease Opportunity – with Asset Homes handling the leasing for the first five years. December 2009 Rs 2000 per sq ft + special charges + statutory charges Rs 15L (~$33,000) for a 592 sq ft studio unit One of the more affordable projects near Infopark. December 2012 Rs 2800 per sq ft + special charges + statutory charges Rs 38L (~$82,000) for a 1097 sq ft 1-BHK unit Huge project (1800 units) and a commercial tower (to be launched). September 2012 NA Rs 29L (~$63,000) for an 853 sq ft unit Fully Furnished and Managed Retirement Home Project in 3 acres. Residents must be 55 or over (in case of a couple atleast one should meet the 55 age limit). 132 units. Relatives can opt to rent a guest room. Details – Recreation Center with games and theater, landscaped garden with walk ways and sporting options. Kadamrayar River Frontage, Services Offered - Wellness Center, Food & Beverage, Guest Homes, and Housekeeping. Ready to Occupy Rs 2900 per sq ft + special charges + statutory charges Rs 53L (~$115,000) for 1495 sq ft 3BHK 170 apartments on 2.5 acres. Good location near Bypass. 3 BHK units ready to occupy. 2 BHK units by 12/2012. December 2010 Rs 6500 per sq ft + special charges + statutory charges Rs 98L (~$215,000) for a 1295 sq ft unit Only 6th floor open for sale. Commercial office complex – central a/c, 24x7 power supply, clubhouse, conference hall, cafeteria. December 2010 Rs 2290 per sq ft + special charges + statutory charges Rs 33L (~$64,000) for a 1290 sft 2 BHK unit Large Project – over 600 apartments on 5.21 acres. 20 floors in 6 blocks. 40-50% available for sale. December 2010 Rs 3000 per sq ft + special charges + statutory charges Rs 40L (~$87,000) for a 1212 sft 2 BHK unit 120 apartments – 2 towers - Around 70% sold out. Great location facing Technopolis. NA Rs 2500 per sq ft + 3.5L per cent + special charges + statutory charges Rs 1.5c (~$325,000) for a 4 BHK 3800 sft Single Family Home on 10 cents of land 43 villas in 8 acres. One of the very few villa projects showcased. Swimming Pool. Periyar River is nearby but not a river-front property. On the average, statutory charges add up to around 11% of the Base Selling Price (BSP). Special Charges include items such as Preferred Location Charges (PLC - Rs 100 or so per sq ft, for a unit with a view), Floor Rise Charge (FRC – Rs 10-Rs25 per floor from the 2nd floor), Parking charges (1L-4L), etc. Completion Dates are only a projection and going by earlier projects, most will encounter significant delays. Some cancellations are also not out of the question. Interestingly, some of the larger builders such as Skyline, Mather, and Sahara were conspicuous by their absence in this year’s event. Apparently, there are restrictions in place which prevents participating builders from announcing new project launches, making price adjustments etc. for a month before and after a CREDAI scheduled event. Those builders who could not conform to one or more of the restrictions declined from having a presence at the event. On the other hand, there were builders who opted to delay their launches and/or price adjustments to accommodate the event – for example DLF postponed its announcement of the commercial portion of its huge 26-acre township project in Kakkanad (New Town Heights). The big takeaway for us was that marketing commercial property along with condo-hotels is the current “in thing”. Some builders even offer “guaranteed return” schemes (see listing for Abad Group’s Nucleus Mall & Office, Maradu and Asset Homes iPulse service apartments above) whereby a certain percentage return independent of whether the builder is able to lease it out is assured. Obviously the financial strength of the builder is the risk with such schemes. Pricing and availability of single-family homes was a surprise. The lowest quote we saw was for Rs 5000 per sq ft (>$120 per sq ft) which comes to well over Rs 70L ($150,000) for a 1500 square foot house. Further, only around a handful of such projects were showcased, mostly by newer builders. For most projects, the pricing is slightly negotiable. So, it is best to raise the topic. When financing, some builders have agreements with banks whereby funding is arranged immediately as opposed to the time of possession. The scheme is packaged, marketed and offered as a discount scheme for buyers as a percentage discount on the Base Selling Price (BSP). The scheme sits well with the builder too as they get upfront payment with the minor inconvenience of having to provide a discount. Other interesting mortgage products are also starting to appear – ARHL (Adjustable Rate Home Loans also called ARM - Adjustable Rate Mortgage) loans tied to the I-Base rate (I-Base + 1.5-1.75%) from the third year with a first year rate of 8.25% was marketed by ICICI Bank. 07/2011 Update: The pricing for the projects in this article have gone up upwards of 10% in the last year. We checked prices on a couple of the projects: Chakolas Orange Park pricing has gone up from Rs 2000 to Rs 2300 psft. DLF pricing has gone up from Rs 2800 to Rs 3200 psft. Also, they announced a Signature Tower with base pricing at a whopping Rs 4800 psft. 10/2011 Update: Olive Kalista (opposite Infopark Kakkanad) has five towers (G+20) and eleven villas. Pricing for the flats in the towers is set at Rs 3100 psft. Floor Rise Charge (FSR) is Rs 10 psft and parking is Rs 2L. 01/2012 Update: Dewa builders has a huge project in Marine Drive with 605 apartments across seven towers (24 floors each) on 6.5 acres.There are 2-3 BR apartments with square footage between 1200 and 2500 and larger penthouses. They have 45-degree to 180-degree ocean view. Pricing is considered reasonable for the area and starts at Rs 5500 psft. 02/2012 Update: Mather Highlands project in Rajagiri Valley very near Infopark has very limited availability at this point. The project is in 2.78 acres with 248 executive apartments across 6 towers right behind 'Leisureville', their completed villa project. Pricing is between Rs 2500 and Rs 2800 psft depending on the floor. Square footage varies between 1233 and 1619 sft. Given Mather's reputation, the pricing is very competitive. The one downside we noticed is that the area looks extremely crowded with all the high-rises concentrated in a relatively small space and it is all located right on the other side of the river from Brahmapuram waste processing unit (stink from that averages a couple of days a week and reach 1-3KM radius depending on wind and other factors). 07/2012 Update: Handing over at Desai Homes Golden Gate is well in progress. Location near Vennala (MLA Road opposite DLF Kakkanad) - 551sft to 1250sft - pricing is between Rs 2100 and Rs 2250 depending on the tower. 496 flats across seven towers, each 15 floors - amenities include swimming pool, kids pool, 400-person theater, TT tables on all towers, gym, sauna, etc. Ideal for small families looking for value - a 1150 square foot 3 BHK apartment was quoted at a grand total of Rs 32L excluding stamp duty and registration charges - 1 BHK in tower 1 can be had for around Rs 15L. The total land area is 3.3 acres which is on the lower side for almost 500 apartments. 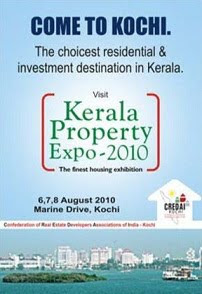 CREDAI Kochi Real Estate Property Expo 2010 - A Report (this post). Your review of the Kochi real estate expo was very useful. Thanks!